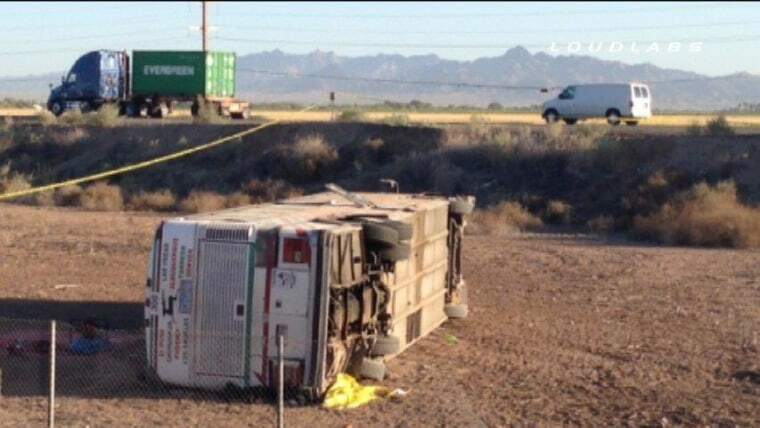 Four people were killed and others were injured after a passenger bus and tractor-trailer crashed in Blythe, California, the California Highway Patrol said early Wednesday. The crash, which happened shortly after 2 a.m. PT. just west of the Arizona state line on Interstate 10, closed all lanes of the freeway in the surrounding area. It was not immediately clear how many people were injured in the accident, but Terri Kasinga, a spokeswoman for Caltrans Department of Transportation, said it appeared to be "a lot." "This truck was traveling eastbound, carrying steel pipes. He jackknifed in the median and the trailer overturned with the pipes, causing those to spill," she said. Some of the pipes rolled into the westbound lane, causing the bus to "either hit some of the pipes, or possibly swerved and hit some of the pipes, and it overturned," Kasinga said. Thirty-two passengers were aboard the bus, which belonged to the El Paso - Los Angeles Limousine Express company, according to NBCLosAngeles.com. The bus had stopped in from Phoenix, where it switched drivers, en route to Los Angeles from El Paso, NBCLosAngeles.com reported.